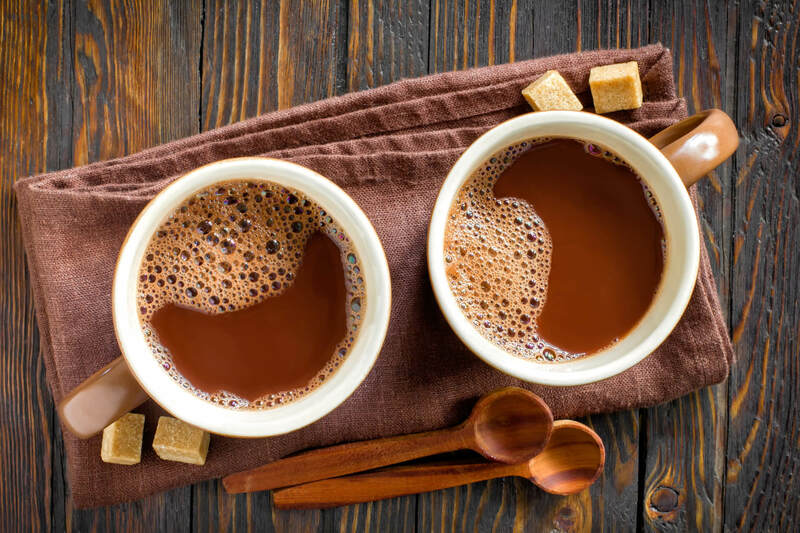 During the Holiday season when it’s cold and snowy outside and you've had a long day getting ready for the festivities, nothing warms and soothes body and soul better than hot chocolate and other a hot milky drinks. Drunk at bedtime, these soothing hot drinks can even help you to sleep better, a boon if you're going through cancer treatment. All the drinks here go beyond the heavily sweetened commercial brands you get at the store or coffee shop, and as you will see, all are easy to make at home. Better yet, you can use whatever your milk of choice may be to make them. Look and learn! Making delicious, thick, velvety hot chocolate at home is easy! Unsweetened cocoa powder is the key. It has a richer, deeper, more chocolaty taste than commercial sweetened drinking chocolates, plus it’s a twofer. It can also be used for baking. Although hot chocolate can be made in the microwave, I think that it tastes more delicious when it is made on the stove top. The extra 1-2 minutes of cooking allows the chocolate to fully bloom. Recipes usually ask for equal amounts of sugar and unsweetened cocoa, but it’s really a matter of taste. In my house, we like our chocolate less sweet, and dense, with 2 teaspoons of sugar to 1 tablespoon of cocoa. See what works best for you. Adjust the amounts if you prefer it richer or sweeter. Homemade matcha latte is where East meets West. Matcha is a fine green powder made from green sencha tea and is traditionally used in Japanese tea ceremonies. A little bamboo whisk is used to froth it up in hot water. Adding steamed milk to this special green tea makes a latte that is hardly traditional, but wonderful. It may feel and taste like an indulgence, but in reality it is super healthy. Matcha is packed with antioxidants. You can use any type of milk you like for homemade matcha latte for a delicious morning treat or afternoon pick-me up. This yummy drink is as energizing as it’s taste is rich and soothing. Enjoy! A chai is sometimes the perfect sweet pick-me up on a really cold day. But going to a fancy coffee shop is sometimes out of reach or just too expensive. Coffee shop chai can be made right on your stove, and you’ll end up with something quite delicious that is lower is sugar than a traditional chai latte. You can buy any brand of chai tea that you like for this Almond Milk Chai Tea, if you get one that is already naturally flavored with vanilla, slowly add vanilla to taste so you don’t end up with something too sweet. When you’re feeling tired or nauseous, I find this turmeric tea to be one of the most soothing, sweetly nourishing drinks you can sip on. It isn’t really tea in the real sense of the word it’s more of a honeyed spiced milk drink, rich with turmeric, a spice we could all use more of in our diets. This delicious drink is an easy, perfect way to get more of it.